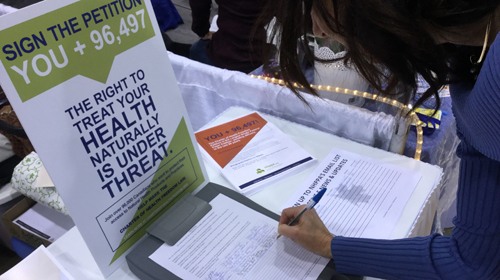 NHPPA is excited to be partnering with Health Show organizers across the country in an effort to educate the public about the threats currently facing Natural Health Products. But, we need more help to get our message shared. Lunch, snacks and parking costs will be covered by NHPPA. Training calls will be done via Skype or Zoom! We are looking for volunteers in the GTA or surrounding areas to work in various capacities at the Total Health Show and Whole Life Expo, both held in downtown Toronto. We have outlined most of the details below. For a look at the show environment, check out our Show Report & Photo Gallery from Total Health Show 2018. If you’re in this area of Ontario, and are interested being part of NHPPA’s work by volunteering your time, we want to hear from you! Email info@nhppa.org with the Subject “Volunteer for Western Shows”. In your email please include: what show you are able to volunteer for and what dates and times you are available. Both days would be the ideal but we are open to the time you have to support. Thank you in advance! We look forward to connecting with you. Working at a Full NHPPA Booth! Volunteers must be available for at least one 4-hour shift on one of the three show days, and we need one of the volunteers to help with the set-up day. Preference will be given to volunteers available to work the entire weekend. Volunteers selected will be notified as soon as they are selected! Primarily interact with show attendees by educating on the threats facing NHPs, discussing available materials and NHPPAs work, and encouraging individuals to sign NHPPA’s Charter petition and/or give a donation. Big emphasis on education! Pack up all NHPPA materials and help load up into NHPPA vehicle. Everything will be transported back to NHPPA headquarters. Spend the weekend with Shawn Buckley! 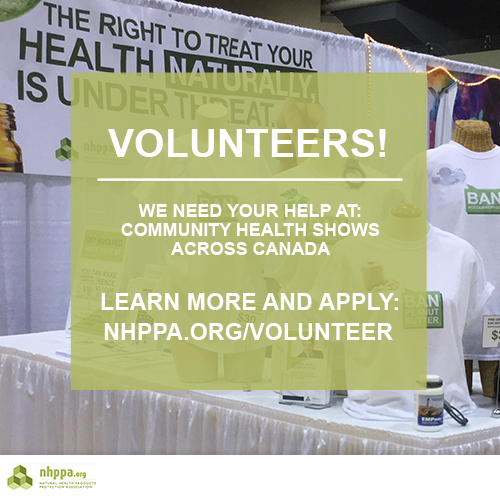 We are looking for volunteers in Victoria, Calgary, and Vancouver to work at The Health Shows in various capacities. We have outlined most of the details below. For a look at the shows, check out the highlights video from Victoria. If you’re in these areas of Western Canada, and are interested being part of NHPPA’s work by volunteering your time, we want to hear from you! Charter of Health Freedom Petition Station! Volunteers must be available for at least one full day of the four days listed below. Preference will be given to volunteers available to work the entire weekend. Critical: you’ll need her cell to return everything to her personally at the end of the day. Pack up petition station materials and return to Virginia Ritchie for next show. The most significant element at the end of the show is to make sure all of the signed petitions are mailed to NHPPA! 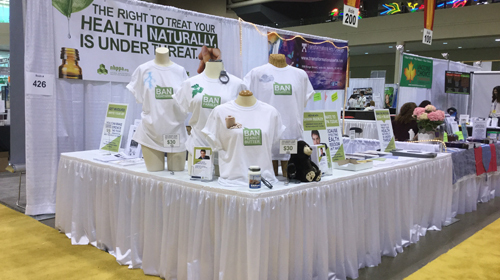 CALGARY HEALTH SHOW – COMPLETE – THANK YOU! See our volunteers in action here and here. Volunteers must be available for at least one full day of the two show days + we need one of the volunteers to help with the set-up day. Preference will be given to volunteers available to work the entire weekend. Volunteers selected will be notified as soon as they are selected! Pack up all NHPPA materials and help load up into Shawn Buckley’s vehicle. Everything will be shipped back to Ontario. VICTORIA HEALTH SHOW – COMPLETE – THANK YOU! See our volunteer in action here and here. Volunteers must be available for at least one full day of the two show days. Preference will be given to volunteers available to work the entire weekend and do the short set up. VICTORIA WOMEN’S EXPO – COMPLETE – THANK YOU!